The Exhibitor Magazine has put together a great article on the advantages you can gain by utilizing your trade show exhibit flooring as an influencing element in your exhibit space. Here are just a few of the great highlights from their insightful and educational take on flooring. Many designers have referred to flooring as the “fifth wall” of an exhibit, implying that it’s just as capable of becoming a messaging medium as any back or side wall. Today, an increasing number of exhibitors are taking advantage of this underappreciated real estate. Rather than making flooring an afterthought, many are choosing immersive options that enhance the in-booth experience. While some take the high-tech route via LED panels and digital projections, others employ analog options that turn what would otherwise be an unremarkable element into a bona fide focal point. Either way, if this trend continues, concealing convention center concrete with boring old booth carpet will be akin to leaving your exhibit’s back wall entirely unadorned. So to help you stay atop the trends going on down below, EXHIBITOR found seven unique uses of underfoot inches that’ll leave you anything but floor bored. 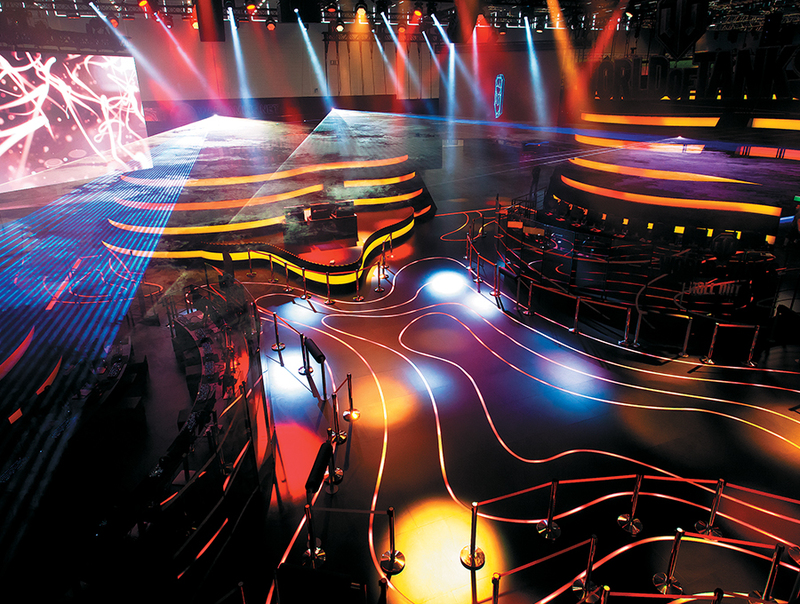 The Trade Group found inspiration in the serpentine contour lines of topographical maps used by soldiers in the 1940s when designing this dramatic exhibit for video-game giant Wargaming Europe SAS. After Gamescom visitors entered the 7,742-square-foot space delineated by red perimeter lighting, they traversed through the booth atop floor-embedded channels housing crimson LED rope lights. But more than mere conceptual accouterments, the illuminated lines served as curving pathways subtly leading attendees directly toward an all-you-can-eat buffet of in-booth gaming stations featuring the company’s latest titles. You don’t necessarily need high-tech tools to add intrigue to the bottom of your booth space. 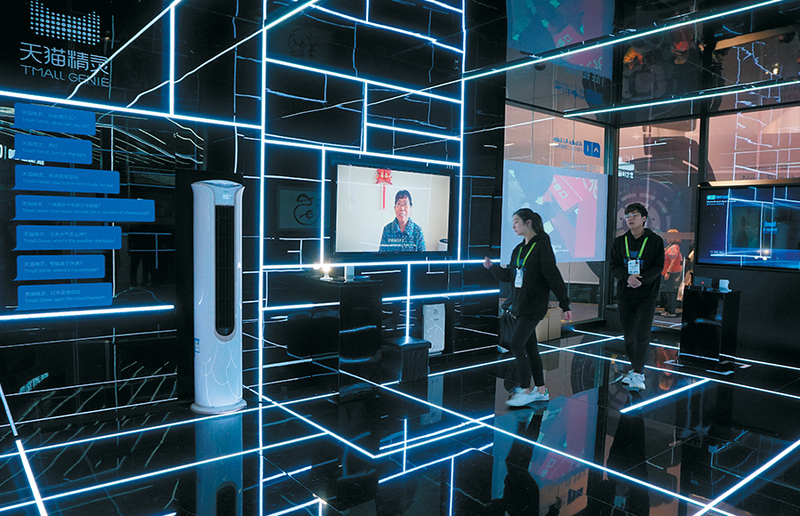 Alibaba China Co. Ltd. proved that point at the 2018 International Consumer Electronics Show by covering one portion of its exhibit (designed by Pico Global Services Ltd.) with black vinyl flooring. The material’s high-polish finish was like an obsidian mirror, reflecting channels of LED strip lighting embedded in the exhibit’s walls and ceiling. The resulting otherworldly aesthetic was akin to something out of “The Matrix,” as a seemingly endless lattice of glowing cubes appeared above and below attendees. 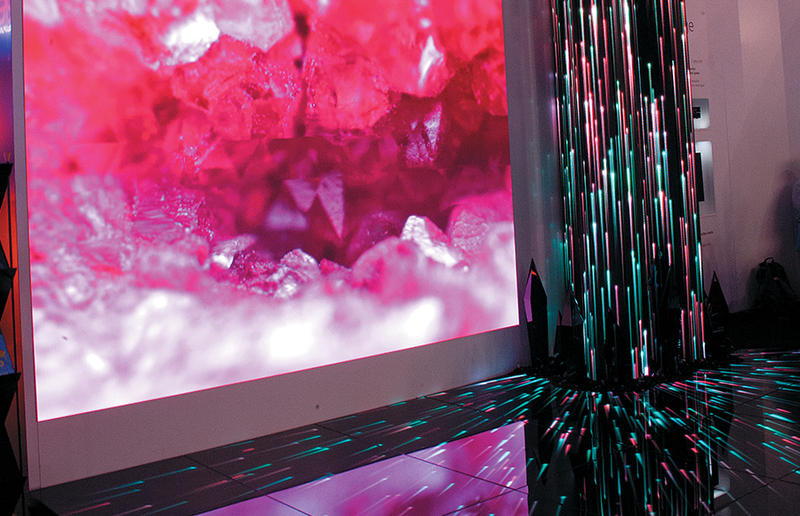 What if instead of attaching LED screens to your exhibit you used them to build the exhibit? Screen Rent e.K. did just that at EuroShop, resulting in a dynamic presence. The back wall, side wall, reception desk, and floor all comprised LED panels featuring content that transformed the space into a variety of environs. In one sequence, screens on the floor emitted a pattern of dappled blue light, while the back and side walls showcased stunning under-the-sea imagery. 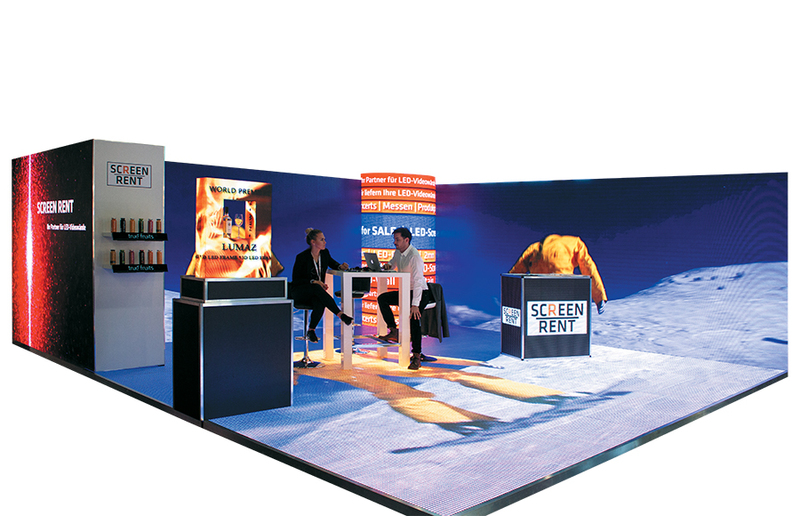 During other sequences, the LED screens displayed video footage of everything from rainforest scenes to powdery-white slopes, the latter of which began with a snowboarder sliding into view on the side wall before hitting a jump, landing on the floor-mounted panels below, and speeding out of sight. By turning both walls and the floor into giant video screens, the immersive assemblage became a disorienting 3-D viewing experience that put booth visitors in the middle of the multimedia action. ZTE USA Inc. tripped the light fantastic at the 2018 International Consumer Electronics Show by painting a portion of its booth carpet with projection technology. The 5G Future Tunnel, a fully enclosed segment of the company’s Derse Inc.-designed exhibit, taught attendees about the benefits of 5G wireless technology. A barrage of projectors turned the tunnel’s flooring into a galaxy of stars that streaked across the gray carpeting, creating the effect that attendees were standing atop a glass panel overlooking the Milky Way – or perhaps inside an invisible wireless signal watching a deluge of data stream past them. To capture attention at Integrated Systems Europe, Ukraine-based Ekta Co. Ltd. created an arresting floor-based display that reached up toward the heavens. Both the exhibit’s flooring and a striking crystalline structure that seemed to defy gravity were clad in 4.8 mm LED panels. Multicolored beams of light that originated on the ground traveled inward toward the exhibit’s back wall before ascending the upright element like tiny interstellar comets following predetermined paths. 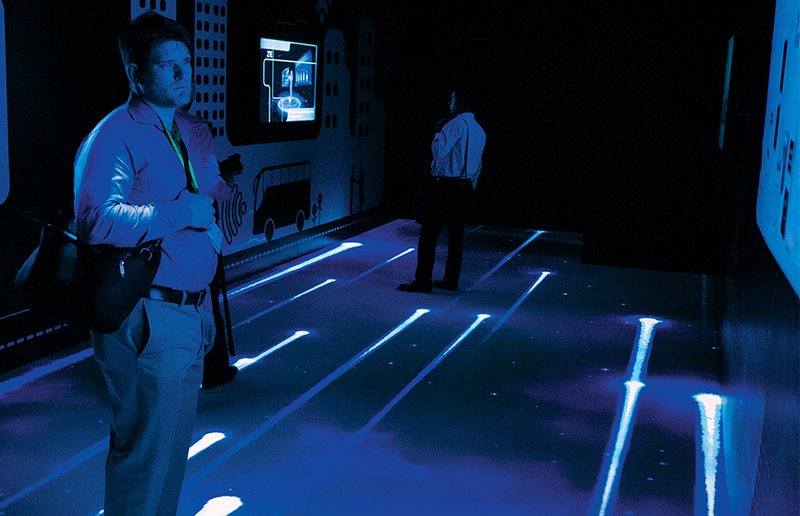 By fusing LED flooring with an eye-catching vertical focal point, Ekta’s exhibit drew attendees like moths to a multimedia flame, giving company reps a chance to extol their messages.